(Nanowerk Spotlight) The complexity of the microenvironment of a biological cell is influenced by many factors, including surface topography and chemistry; matrix stiffness; mechanical stress; molecular liquid composition and other physiochemical parameters. However, most artificial biointerfaces are developed based on just a single chemical or physical factor to direct cell behaviors. The functions performed by these artificial biointerfaces are far simpler than those performed in the natural cell microenvironment. In an effort to more closely mimic a cell's natural environment, a research team in China has fabricated an antibody modified reduced graphene oxide (rGO) platform and used it to significantly improve the efficiency for capturing circulating tumor cells. This is an important issue in cancer medicine because metastasis – the process of cancer spreading from its original site to distant tissues – is caused by marauding tumor cells that break off from the primary tumor site and ride in the bloodstream to set up colonies in other parts of the body. These breakaway cancer cells in the peripheral blood are known as circulating tumor cells (CTCs). Detecting and analyzing these cells can provide critical information for managing the spread of cancer and monitoring the effectiveness of therapies. 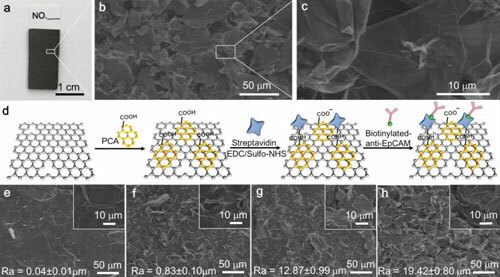 Reporting their findings in Advanced Materials ("Antibody-Modified Reduced Graphene Oxide Films with Extreme Sensitivity to Circulating Tumor Cells"), the scientists describe their platform's extremely sensitive CTC static capture performance without the need for complex microfluidic operations. "Our antibody modified rGO films possess several synergistic topographic interactions provided by their low stiffness which, compared to other rigid artificial substrates, more closely mimics the cellular microenvironment of living organisms, thus facilitating cell–environment interactions," Dr. Yingying Li, a researcher in Prof. Shutao Wang's research group at the Technical Institute of Physics and Chemistry, Chinese Academy of Sciences, in Beijing, tells Nanowerk. "For example" she explains, "the rough texture of rGO might enhance topographic interactions between CTCs and biointerfaces; the low stiffness nature of rGO might facilitate cell-matrix interactions, thereby contributing to highly efficient CTC capture. Moreover, the negative charge and superhydrophilicity of antibody modified rGO renders the surface inert to nonspecific cell adhesion, which is helpful for decreasing the white blood cell background – an issue that remained a problem in previous studies." To demonstrate the effectiveness of their rGO material, the scientists fabricated a test kit to perform sensitive CTC specific recognition via a simple static method, without the need for complex microfluidic devices or operations. They showed that the antibody-modified rGO films can efficiently capture CTCs from fresh whole blood (which contains less than 10 CTCs/mL-1). The test kit, suitable for clinical use, requires a blood sample from the patient that can be as low as 1 mL; which is much smaller than in conventional testing methods. "While we addressed four microenvironmental factors that have an impact on cells' properties, the real nature of cell interactions is much more complex with almost endless physical and chemical properties influencing cells," Li points out. "While we are confident that more and more complex and multi-matching platforms will be designed and fabricated, getting close to mimicking natural cell environments is a huge challenge."